A couple weeks ago the Capitol Bourbon Committee met to blind taste the three standard Four Roses offerings: Yellow Label, Small Batch and Single Barrel. The Yellow Label offering is a blend of all ten Four Roses Recipes and clocks in at 80 proof. Small Batch contains four recipes at 90 proof. The Single Barrel was the standard single barrel recipe, OBSV, and was 100 proof. Four Roses is my favorite bourbon, so I was excited to see how our panel of seven tasters (six members and one special guest) rated each selection. 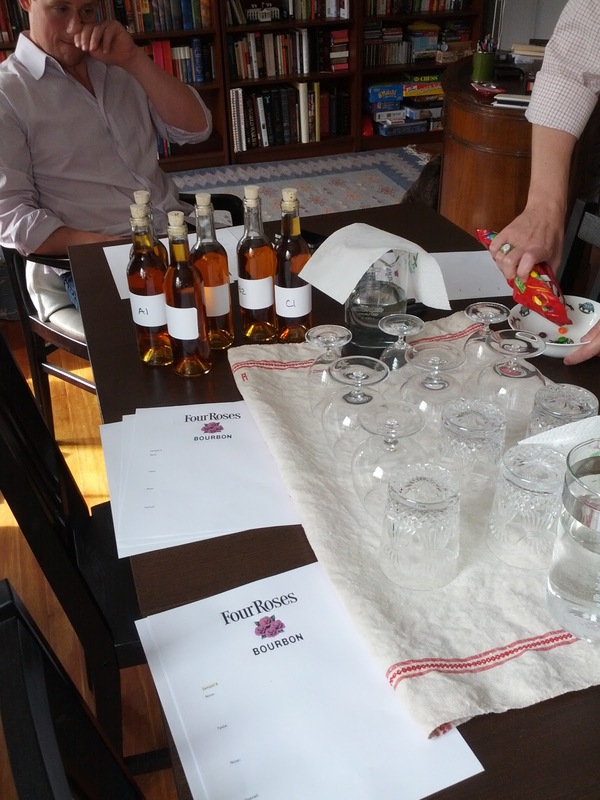 In a general sense, all seven tasters tasted definite differences between what turned out to be the Yellow Label and the Small Batch and Single Barrel. And by that I mean that the Small Batch and Single Barrel stood out above the Yellow label in nose, taste, and finish. Taste: Rye, light and smooth, more misty pepper than sweetness, up-front fruit, velvet-y mouth feel, slight honey, corn and charcoal, floral and mellow, some vanilla, an easy drinker. Finish: Vanilla, oak, balanced with trailing sweet finish, very smooth, leather and tannins, sweet and spicy finish, I love this finish! Taste: Earthy, charcoal, spices, pepper, hot on front of tongue, vanilla custard, spiciness, floral flavors, vanilla, cinnamon and nice heat. Finish: Smooth spice, rounded and hints of leather and vanilla, great finish, creamy on the tongue, a slow burn, spicy and vanilla. Last words: I can tell by the handwriting that as we progressed we got a little tipsy. We also got to bullshitting and maybe weren't as diligent with the notes as we could of been. It scarcely matters. The Capitol Bourbon Committee isn't about formally scoring bourbons; it's about getting together with a few friends and sharing the bourbon experience. A great time was had by all, and we are already planning our future events. 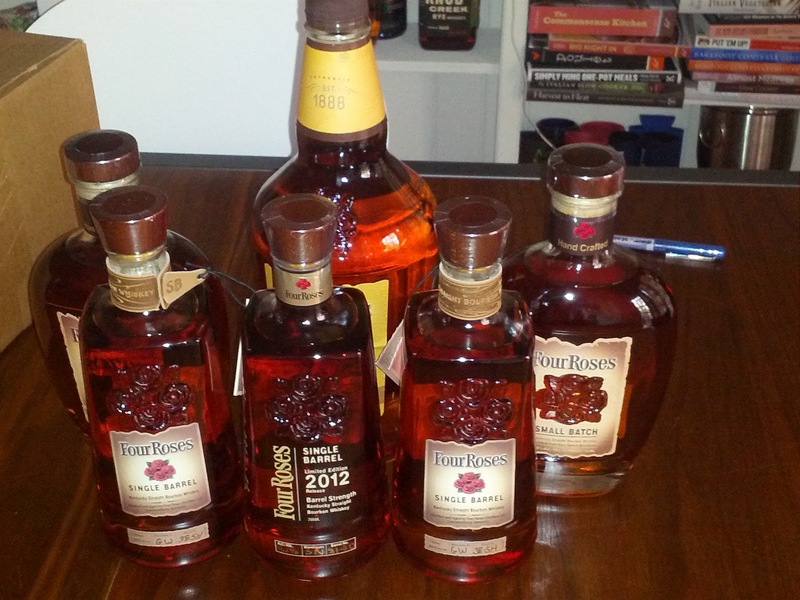 Four Roses happens to be my favorite distiller, as well. My wife loves the Yellow Label, but she's open to single barrel offerings. I love them all, but go for the barrel proof OBSKs and standard Single Barrel more than the others. I'm also in DC and have a few bourbons open, some new and some dusties - if you have an empty seat at a gathering, I'm happy to fill it! If you'll email me at keith(dot)boyea(at)Gmail.com, I'll let you know about upcoming tastings! We are always open to having fellow bourbon enthusiasts join the committee! (Especially Four Roses fans.) I had an OESK that blew my mind and next year's Limited Edition Single Barrel is OBSK (https://www.ttbonline.gov/colasonline/viewColaDetails.do?action=publicFormDisplay&ttbid=12298001000451) You'll want to make sure and pick that one up!